Upgrading online did not work for me as they came back saying it’s only for new customers and only offered me it for $75. So I called in instead and was easily able to get the $60/2yr price with some waiting on hold on the phone of course! So here's my experience with shaw today about this deal. I called in this morning and waited about 30 min before i got to talk to an agent. Fyi, I'm on internet 150 and paying $85 per month before taxes and long time shaw customer. After verifying info, I asked if i'm still on contract. The agent explained to me that my contract was expired way back and asked me why I asked that. I explained that telus is offering internet 150 for $60 so thinking about switching to them. The shaw agent acted like he didn't know about the telus promo and told me that he needs to verify that on their website. He put me on hold while he verified it and it took about 2 or 3 min. He verified with me that telus is offering internet 150 for $60 /w $250 credit for 2 year contract. Then he said he can't offer the same deal($250 credit part), but he said he can offer something similar deal which was internet 150 for $55 per month, fixed rate for 2 years. I agreed to it and went through verbal contract thingy and everything was set! On the 1st call, without transferring to loyalty department. My guess is shaw put loyalty agents on call centre as well due to high call volume or something. Anyway, the whole thing only took about 10 min with shaw agent. I'm under another 2 years but I have no problem staying with them as I was /w shaw for quite long time. Hope this helps ppl who haven't called already! Last edited by styner_ca on Nov 24th, 2018 11:55 pm, edited 1 time in total. Thanks Styner for that. My parents contract with Shaw was up a while ago. They are paying $195 for TV, Internet & Home phone. Meanwhile I am paying $95 for the same thing with the 12mnths no contract last year. With that being said, does anyone know what the medium TV & home phone deals should be at? 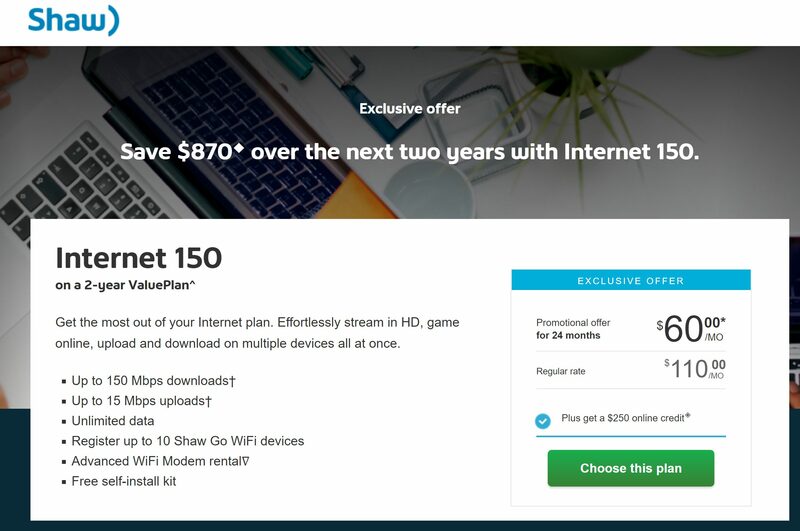 Seems like the internet 150 should be at $60/month. Just to have the knowledge before phoning in to make a dealio. Or just switch to Telus. So current Shaw customer with internet 150 paying $85 per month (with tv and phone totaling around $195). Spoke to agent and she transferred me to retentions. Spoke to retentions and I just told her if we qualify since my $85 isn’t up until next year. She gave me $60 per month for 2 years, upgraded modem and blue sky for my entire home . She was pleasant and very helpful even guaranteed my grandfathered in best of HD rate for 2 years. On top of new hardware saved $30 per month. Very happy and thanks to you guys’ experiences and tips. is that internet 150 or 300? Did you get any credit or netflix deal? I just renewed my shaw plan recently to $70 for 2 years internet 300 didnt get any credit or netflix deal. Wondering if I can phone retentions to make some adjustments. Hi Pentexplorer - it is Internet 150 and no credits but she did give me all the upgrades. So I think you still have a good deal since you pay less than advertised Internet 300. I see cool.. what you mean by upgrades? Upgraded our modem and our tv boxes to blue Sky free rentals. Now I can sell my existing hd pvr and cable boxes Arris. But I am sure everyone gets this upgrade I assume? Longtime Shaw customer paying $85/mo for Internet 150, contract expired months ago. Call-in wouldn't match the Telus offer (best they would do was $70/mo), but Retentions gave me $60/mo for Internet 150. Tried to upsell me to Internet 300 for $70/mo since my data usage is over the limit consistently. I said no. He then made my Internet 150 unlimited data. I pushed him for a year of Netflix, so he gave that to me too. Not sure which version of Netflix though. Will find out when I get the coupon code. If it's not the 4 screens version, I'll call Shaw back and threaten to cancel as it will still be within the first 10 days of the new term. He said they are sending me a new modem too. Ok whatever. Anyone know if 2 portals and 1 4K box is enough for blue sky on 3 TVs? Feeling they need to give me another portal one for each tv unless the actual 4K box acts as a portal too. Just spoke with loyalty and was able to get Internet 300+Medium TV Pick 7 for $120/month with a 2 year value plan. 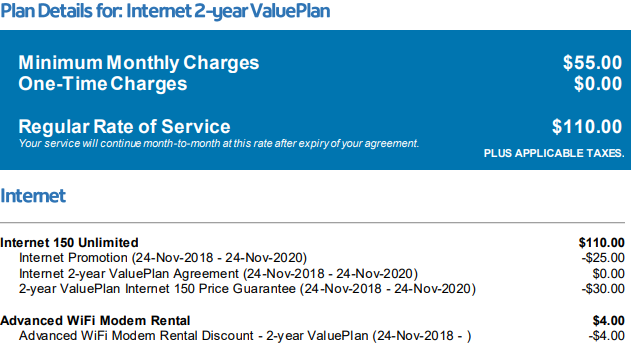 The Internet 300 has a rate of $60/month after the discounts. Been with Shaw for 2 years and just finished a 2 year value plan. after 2 unsuccessful attempts to even talk to someone over 2 days, got through today. after a 30 min wait for a callback then told i was next in line, ANOTHER 1 hr wait on hold. cancelled my cable finally. when CSR came back to me, he offered me $10 off/month and upgraded me to 150Mbps (from 100) for a year for my trouble. the initial offer was $85 for 24 months @ 300 mbps and 1 yr of Netflix. Hi, what is Pick 7?